Mitt Romney's effective tax rate is very low: Most economists think it should be. 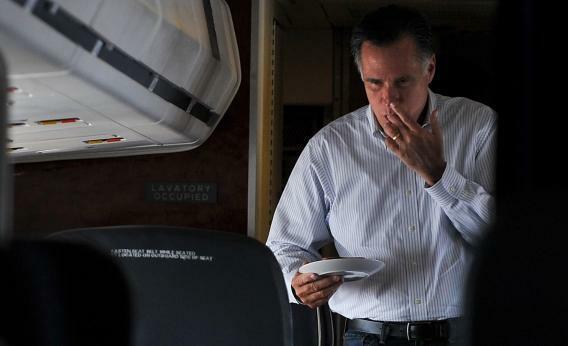 US Republican presidential candidate Mitt Romney licks his fingers while returning to his seat after making himself a peanut butter and honey sandwich aboard his campaign plane as he heads to Las Vegas, Nevada on September 21, 2012. The news is out that Mitt Romney paid a 14.1% effective tax rate on an income of over $13.7 million in 2011, a number that will strike many people as high but that is actually artificially inflated. He didn’t fully deduct all his charitable contributions in order to make sure his effective rate stayed above 13 percent. The main reason Romney’s effective rate is so low is that the American tax code contains a lot of preferences for investment income over labor income. That’s something that strikes many people as unfair on its face, and particularly unfair since it often means very low rates for extremely rich people like Rommey. And Rommey himself as a rich guy who’s also a member of the political party seen as favoring the rich, and who’s been recorded as whining that the working poor are undertaxed is perhaps not an ideal messenger for a defense of this policy. But this is definitely an issue where the conservative position is in line with what most experts think is the right course, and Democrats are outside the mainstream. The reasoning is basically this. You imagine two prosperous but not outrageously so working people living somewhere—two doctors, say, living in nearby small towns. They’re both pulling in incomes in the low six figures. One doctor chooses to spend basically 100 percent of his income on expensive non-durables. He goes on annual vacations to expensive cities and eats in a lot of fancy restaurants. The other doctor is much more frugal, not traveling much and eating modestly. Instead, he spends a lot of his money on hiring people to build buildings around town. Those buildings become houses, offices, retail stores, factories, etc. In other words, they’re capital. And capital earns a return, so over time the second doctor comes to have a much higher income than the first doctor. And the thinking is that world number one where people with valuable skills take a large share of their labor income and transform it into capital goods is ultimately a richer world than the world in which such people just go out to a lot of fancy dinners. That’s the theory, at any rate. It’s a pretty solid theory, it’s in most of the textbooks I’ve seen, and it shapes public policy in basically every country I’m familiar with. Even researchers like Thomas Piketty and Emmanuel Saez (see “A Theory of Optimal Capital Taxation”) who dissent from the standard no taxation of investment income position think capital income should be taxed more lightly than labor income. Empirically, it’s a bit difficult to verify that variations in capital gains tax rates and the like really are making a material difference to investment levels. But then again the data is noisy. What’s more the thing we have the most real-world experience with is measures like George W. Bush 2003 tax cut for investment income which was financed with government borrowing rather than higher wage taxes, consumption taxes, or spending cuts. It’s not at all clear that the basic theoretical considerations in favor of low taxes on investment income apply to the case of a debt-financed tax cut. This is also separate from the question of whether hedge fund and private equity fund managers should be allowed to pretend their labor income is really investment income by calling it “carried interest” and paying at a low rate.